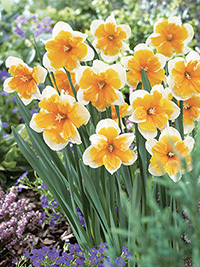 These are fancier daffodils, a bit more special. Including pink cup, split corona and pure white. White perianth with a rich pink cup, a much improved version of daffodil Accent. Very strong grower, late season flowering. 40cm tall. A distinctive two-tone large pink cup, darker at the edge. Very strong grower. Late season flowering, 40cm tall. 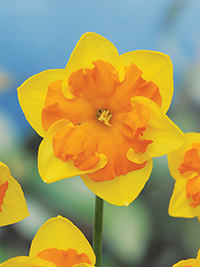 Split corona daffodil with a vibrant yellow perianth and a bright orange frilled corona. An exciting new variety. Mid season flowering, 40 cm tall.